After a period of fasting and prayer, Esther puts her own life at risk by pleading with the king to save her people (7:3-4). Ahasuerus grants her petition, and the treachery of Haman is exposed. Haman is hanged in place of Mordecai who had saved the kings’ life on a previous occasion. Thus, in the future, these events were to be commemorated by “feasting and gladness . . . sending gifts of food . . . and presents to the poor” (9:22). These customs continue to be an integral part of Purim celebrations. The book of Esther is unusual in that it is the only book of the Bible that does not contain the name of G-d*. In fact, it includes virtually no reference to G-d. Mordecai makes a vague reference to the fact that the Jews will be saved by someone else, if not by Esther, but that is the closest the book comes to mentioning G-d. Thus, one important message that can be gained from the story is that G-d often works in ways that are not apparent, in ways that appear to be chance, coincidence or ordinary good luck. Many have noted the echoes of Purim in the Nuremberg war crime trials. In the Book of Esther, Haman’s ten sons were hanged (Esther 9:13); in 1946, ten of Hitler’s top associates were put to death by hanging for their war crimes (including the crime of murdering 6 million Jews). Another echo of Purim is found in the Soviet Union a few years later. In early 1953, Stalin was planning to deport most of the Jews in the Soviet Union to Siberia, but just before his plans came to fruition, he suffered a stroke and died a few days later. He suffered that stroke on the night of March 1, 1953: the night after Purim (Note: Jewish days end at sunset; you will see March 1 on the calendar as Purim). The plan to deport Jews was not carried out. In addition to “eating, drinking, and being merry,” the celebration includes donations to charity. The sending of gifts of food and drink is referred to as shalach manos (lit. sending out portions). Jews will often make monetary donations to charities they support during this time or will give money to needy people. Among Ashkenazic Jews, a common treat at this time of year is hamentaschen (lit. Haman’s pockets). These triangular fruit-filled cookies are supposed to represent Haman’s three-cornered hat. 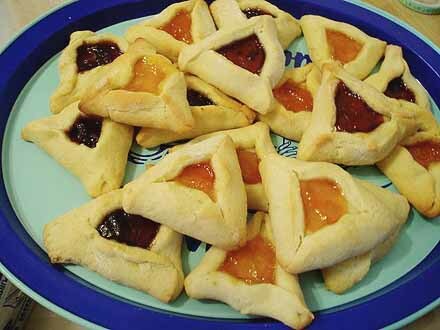 You can find a recipe at Judaism 101: Purim. Unlike more serious synagogue occasions, both children and adults often attend the Megillah reading in costume. Traditionally people would dress up as characters from the Purim story, for example, as Esther or Mordechai. However, nowadays people enjoy dressing up as all manner of different characters: Harry Potter, Batman, wizards, you name it! Story Path: An Online Children’s Literaturesite from Union Presbyterian Seminary in Richmond offers a description of The Story of Esther: A Purim Tale retold by Eric A. Kimmel (Written for ages 5-8). Since this story only appears this one time in our three-year lectionary, adults and children may enjoy hearing the story! This entry was posted in Education, Feast Days, Ordinary Time and tagged Book of Esther, Purim. Bookmark the permalink.